NICCY is carrying out a big piece of work, called a rights based Mental Health Review. Tell the Government how to make mental health services better. 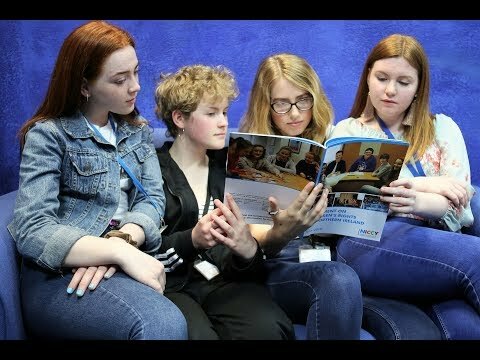 During April to November 2017 NICCY has been gathering young people’s views through an online survey and by talking to young people through face to face meetings. The online survey was for any young person aged 11-21 yrs old to complete that had experience of having had or trying to get help for their mental health. We carried out 31 interviews with young people that had a mental health problem along with a learning disability or problems with alcohol and drugs. During early 2018, NICCY will be meeting with professionals and practitioners to share emerging findings and to inform its recommendations. The final report which will set out the findings and recommendations from all the information gathering will be published in Autumn 2018. Gathering children and young people’s (and their parents, guardians and advocates) experience of accessing or trying to access care and treatment from mental health services. Look at and map the official information on mental health services and support. Look at and map the money being spent on mental health services and support. You can view our Mental Health Infographic below and you can also view our interactive version here. When we use the word ‘mental health’ for short, we mean a young person’s ‘emotional wellbeing and mental health’. This includes conditions such as depression, anxiety, stress, bipolar disorder, eating disorder and the wide range of other mental health problems that children and young people may experience. When we use the term ‘mental health services / support’ we mean, those services or support provided through a GP, Counselling in School / University / College, Community Organisations, CAMHS Out-Patient appointments, A&E, Out of Hours GP, and hospital care. You can read the press release from the launch of the Review here (19th June 2017) and follow up release here (22nd Nov 2017). There are a number of reports that NICCY has produced that provide more background information on the Review, they are listed below. If you have any questions you can contact the Lead Researcher- Christine Irvine at Christine@niccy.org or on 028 9031 6384.